Boxing, as we know, does not operate like most other sports. There is no over-seeing governing body implementing a domestic or international fixture list. Without these pre-dertermined guidelines in place we are relying on many moving parts working together over the negotiating table in order for fights to get made. An important player in this deal making routine is the boxing manager. Working for their fighter, the manager is there to ensure his/her boxer is rewarded fairly. This piece features experienced manager Frank Espinoza. Frank is well known on the boxing scene – representing fighters since the early 1990s – he has helped guide ten of his clients to world title honours and is now a member of the California Boxing Hall of Fame. 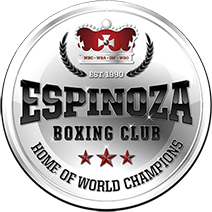 Read on as Mr Espinoza discusses his role within boxing and find out what he has to say about one of his current world champions. Mr Espinoza is on Twitter @EspinozaBoxing and further reading on him and his career can be found at espinozaboxingclub.com. CM: Hi Frank. From your bio on the Espinoza Boxing website I see you grew up in East LA. What was it like growing up there and how have the lessons you learned helped with what you do now in the boxing industry? FE: I did grow up in East LA and although it was a positive experience you had to learn to deal with a lot of different personalities. It was a tough environment and you had to learn to adapt in order to eventually succeed. Very similar to my tenure in boxing. CM: Simple one here. Can you explain how the boxing manager fits in to the machinery of the sport? What tasks do you undertake for your clients etc? FE: A good manager works for his client to make sure their business interests are protected. The job of the fighter is to fight and the job of the manager is to make sure his fighter is taken care of. Managers are the liaison between industry players, like promoters, who are very savvy and tough to negotiate with. That’s when the skills of an experienced businessman like myself come in handy. CM: You want to add a new boxer to your roster. How do you make the case to the fighter that joining Team Espinoza is the best decision for their career? FE: I let a potential signee know that I’ll always fight for his interests. I point to my successful track record with the ten world champions we’ve produced. I’ve been a businessman for decades. When fighters are dealing with promoters and others in the boxing industry, they need an experienced professional who will negotiate for them. At the end of the day they’ll be better compensated and protected with my help. CM: One of the world champion fighters you managed, Israel Vazquez, was involved in a famous trilogy with Rafael Marquez. The fights took place within a year. How intense were things behind the scenes around those fights? FE: It was a very intense fight series and we made the fights within the calendar year because we knew we had to strike when the iron was hot. Israel wanted those fights badly. He wanted to prove he was the best fighter of the two. He also had a deep desire to please the fans and that’s exactly what he did by showing them his bravery, his ferocity and his humbleness after each fight. The negotiations were tough and we had to get creative but ultimately we were very successful with the trilogy. CM: You currently manage one of my favourite boxers, WBO featherweight champion Oscar Valdez. How do you see Oscar’s upcoming fight with Scott Quigg going and how good do you think Oscar can be – could he be a multiple weight world champion for instance? FE: Oscar has tremendous potential to be a champion in several weight classes. He’s someone who I feel will bring his power to any division. With Oscar, the level of talent is so high that fighting effectively in different divisions shouldn’t be a problem. As for his fight against Quigg – it’ll be a tough fight, Quigg is a talented fighter but we’ll be ready for him. Oscar has trained like never before. I think we’re going to see a stellar performance from Oscar. CM: What plans do you have for the other fighters you represent this year? FE: I am excited. 2018 is going to be a great year. The plan is to keep all my guys busy, keeping their skills sharp to help them reach their goals of becoming champions in the near future. CM: Finally, you have become a successful, highly respected member of the boxing community. With plenty of accolades already under your belt, what are your goals for the future? FE: Thank you for that. I’m still extremely passionate about boxing and I’ll continue managing fighters with elite level potential. I truly love this sport and I love being someone that could possibly help to change a fighter’s life. I’m always looking for better opportunities for my fighters and I’ll never stop learning and evolving as a businessman or as a manager.